Complete Civil War Uniform. Confederate Uniform Special. Civil War Specials. Made in USA. 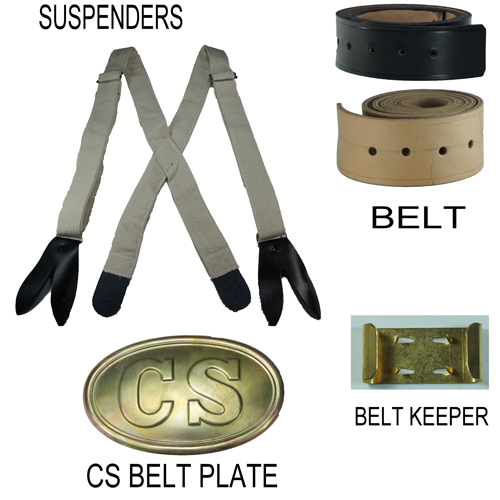 C&C Sutlery offers a complete basic uniform package for the Confederate soldier. 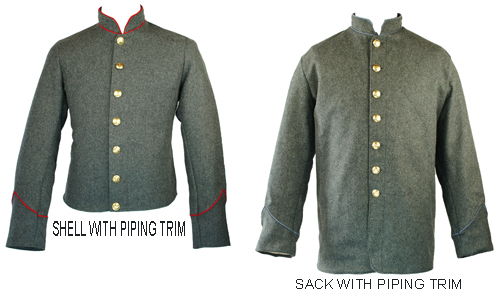 This is an economical way to get started in reenacting or to outfit the younger soldier who is still growing. And since gently used Civil War clothing is always in demand you can sell the uniform as you upgrade and specialize or the young soldier out grows it. Our clothing is made of the highest quality wools and materials and is Proudly Made in USA and the Great State of Idaho. All Coats, Jackets, Trousers, and Shirts with the exception of STANDARD Colors, Styles, and Sizes as listed below are custom made specifically for you and are subject to a restocking fee. STANDARD SHELL JACKETS & SACK COATS: Sizes 38-48 Regular Length; Enlisted; Unlined; Untrimmed; 7-Button Front Shell Jacket in Navy Blue or Medium Gray Wool, 7-Button Front CS Sack Coat in Medium Gray wool, or 4-Button Front US Sack Coat in Navy Blue Wool. STANDARD TROUSERS: Foot or Mounted Size 34-42, Side Seam Pocket, No Rank Stripe or Cording Trim, Sky Blue, Navy Blue (Foot Trouser Only), or Medium Grey Wool. 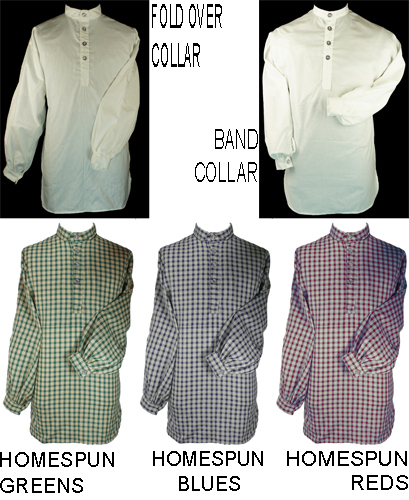 STANDARD SHIRTS: Sizes M-3XL 4-button shirts White, Unbleached, or Homespun. 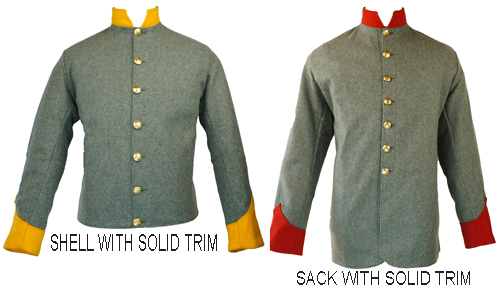 When Ordering Your Uniform Special Choose a Coat, a Trousers Color, a Shirt, a Hat, and Belt Color using the drop down menus below the product descriptions. 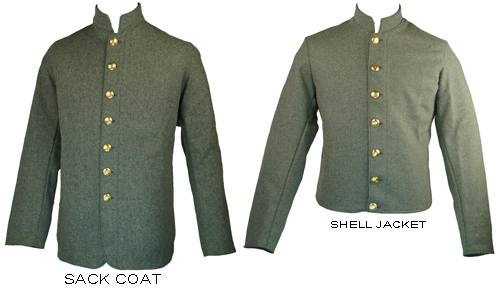 The CS Sack Coat is a 7-button front coat using CSA buttons.The coat has a front inside pocket and is unlined. A muslin lining is an available option. This basic Shell Jacket is unlined and has a 7 button front of CSA buttons. The jacket features straight sleeves with non-functional cuffs without buttons. The jacket has a standing collar. A muslin lining is an available option. The Confederate foot trousers is made of wool with cotton facings and pockets. The button fly is lined with cotton to make it more flexible for buttoning. The adjustable "V" back on the waistband has eyelet holes for a tie to allow for waist adjustment. There is a dart on the back of each side that makes the trousers taper into the waistband. The trousers have a watch pocket and side seam pockets. Fly buttons and suspender buttons are pewter. Unbleached, Bleached White, or Homespun of Blues, Greens, or Reds. Choose Fold Over or Band Collar. The regulation four button shirt is patterned after the original. This loose fitting of shirt has button cuffs and a gusseted underarm. The shirt-tail hem is curved. The four button shirt is popular for its comfort and style. Made of 100% cotton. PROUDLY MADE IN USA. NOTE: The homespun colors above are EXAMPLES of blues, greens & reds patterns. 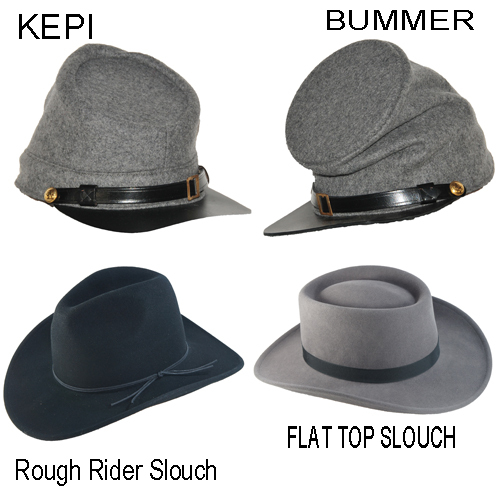 The CS Kepi is made in one color of wool for both cap and band. The kepi has a heavy leather brim, functional chin strap with brass side buttons and center buckle, leather sweat band, and is lined. PROUDLY MADE IN USA in the GREAT STATE of IDAHO. The CS Bummer (forage cap) is taller than the kepi and the crown drapes forward. The cap has a heavy leather brim, functional chin strap with brass side buttons and center buckle, leather sweat band, and is lined. PROUDLY MADE IN USA in the GREAT STATE of IDAHO. The Slouch Hat is a wide-brimmed hat. The crown and brim can be shaped to the desire of the soldier. The slouch hat is correct for both US officers and enlisted men. This slouch hat is made of top quality wool felt with a 3 1/2" wide brim. It has a sweatband. This hat is packable and water repellent. The hat is available in black, brown, or gray. The Rough Rider Slouch hat has a 3 1/2" wide brim. The Flat Top Slouch hat has a 3" brim. Both PROUDLY MADE IN USA.